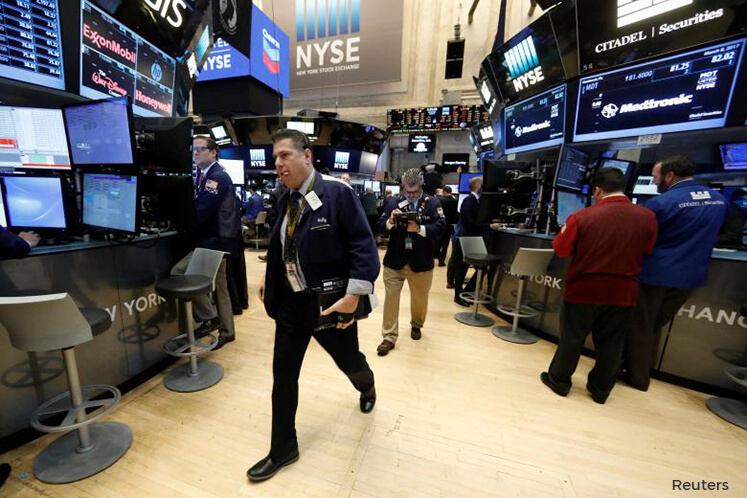 (March 31): Wall Street gained on Thursday, led by financial shares, after data showed U.S. economic growth was stronger than previously reported last quarter, helped by robust consumer spending, and the tech-heavy Nasdaq set a record closing high. The energy sector rose for a third straight day, supported by stronger oil prices and a 8.8-percent gain for ConocoPhillips, the biggest percentage riser on the S&P 500 after it agreed to sell oil and gas assets. U.S. economic growth slowed less than previously reported in the fourth quarter as robust consumer spending provided a boost, the Commerce Department said. Gross domestic product increased at a 2.1 percent annualized rate instead of the previously-reported 1.9 percent pace. A record-setting rally for stocks in the wake of President Donald Trump's November election stalled somewhat this month, with some investors pointing to risks to Trump's agenda, including tax reform, after his fellow Republicans failed to pass a healthcare bill. The GDP report is "basically an affirmation that, hey, at the end of the day, Washington will do and say whatever they are going to do, but the economy is marching forward," said Karyn Cavanaugh, senior market strategist at Voya Investment Management in New York. "It’s not just the U.S. economy, but we do see definitely improvement throughout the world," Cavanaugh said. The Dow Jones Industrial Average rose 69.17 points, or 0.33 percent, to 20,728.49, the S&P 500 gained 6.93 points, or 0.29 percent, to 2,368.06 and the Nasdaq Composite added 16.80 points, or 0.28 percent, to 5,914.34. The Nasdaq closed at a record high after rising for a fifth straight session. Financial shares surged 1.2 percent, with Bank of America and Citigroup propping up the S&P 500. The defensive utilities sector was the worst-performing group, falling 0.7 percent. Investors are also turning their attention to the impending first-quarter earnings season to justify lofty valuations for stocks. The S&P 500 is trading at about 18 times earnings estimates for the next 12 months against its long-term average of 15. "We continue to see decent-to-improving economic data primarily in employment," said Tim Ghriskey, chief investment officer of Solaris Asset Management in New York. "We are likely to see a good quarter in terms of earnings, so I think there is some anticipation perhaps in the market here." In corporate news, Lululemon Athletica shares plunged 23.4 percent after the Canadian yoga and leisure apparel retailer said first-quarter comparable sales were expected to fall. About 6 billion shares changed hands in U.S. exchanges, below the 6.8 billion daily average over the last 20 sessions. Advancing issues outnumbered declining ones on the NYSE by a 1.56-to-1 ratio; on Nasdaq, a 1.49-to-1 ratio favored advancers. The S&P 500 posted 20 new 52-week highs and 1 new lows; the Nasdaq Composite recorded 99 new highs and 19 new lows.